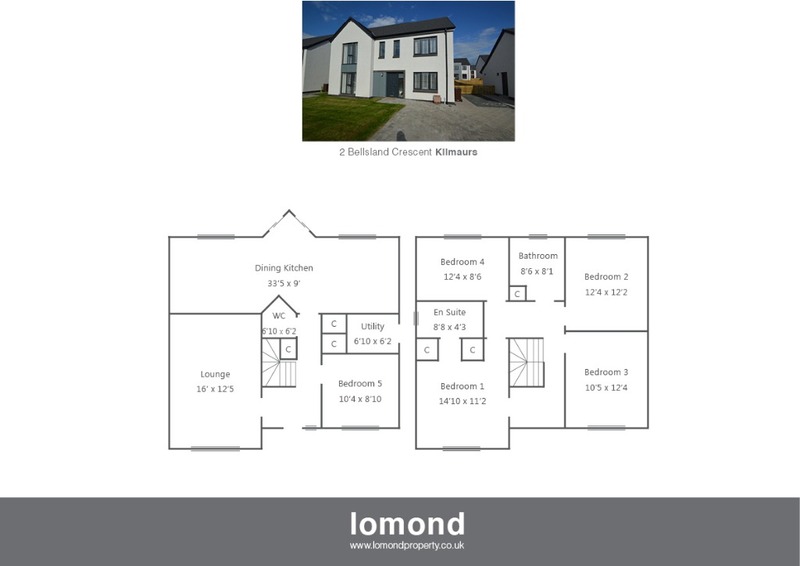 The “Juniper” detached villa built by Hope Homes (built March 2018) offers excellent family sized accommodation over two levels, with everything the modern family seeks. The property offers luxury throughout, with 5 bedrooms, master en suite, lounge, dining kitchen, and downstairs WC , amongst its many benefits. Kilmaurs offers excellent commuter links across Ayrshire and beyond to Glasgow. In summary the property layout extends to a most spacious and welcoming hallway with stairs rising to the upper level. The formal lounge is off the main hallway and is finished to neutral décor throughout and stylish floor coverings. To the rear of the property the dining kitchen with separate sitting area is an area for all the family to enjoy, with patio style doors to the rear garden. The kitchen is beautifully presented, with modern floor and wall mounted units, breakfast bar, and utility area off. The remainder of the ground floor comprises of a WC and Bedroom 5/Study. The upper level houses four bedrooms, all of which are doubles, and a family bathroom. The master bedroom features fitted wardrobe space and benefits further from a luxury en suite shower room. The family bathroom is stunning, with bath, separate walk in shower, WC and WHB, all finished to modern tiling. Externally the property has grounds to the front and rear. To the front the garden is laid to lawn, with off street parking. To the rear the garden is large with patio area off the rear door. Viewing is highly recommended to appreciate the quality and finish throughout. Bellsland is a brand new estate built by Messrs Hope Homes. Kilmaurs town is close by and provides access to a range of amenities including supermarkets, bars, restaurants and town centre shopping. There are a number of local primary and secondary schools within the area.